If you are like me, you probably didn’t need to hunt down all of the Voyager Class figures. It becomes redundant when there aren’t enough Delixe figures to build a whole new Combiner. Well, I was at Marshall’s yesterday, and they had both Scattershot and Onslaught. 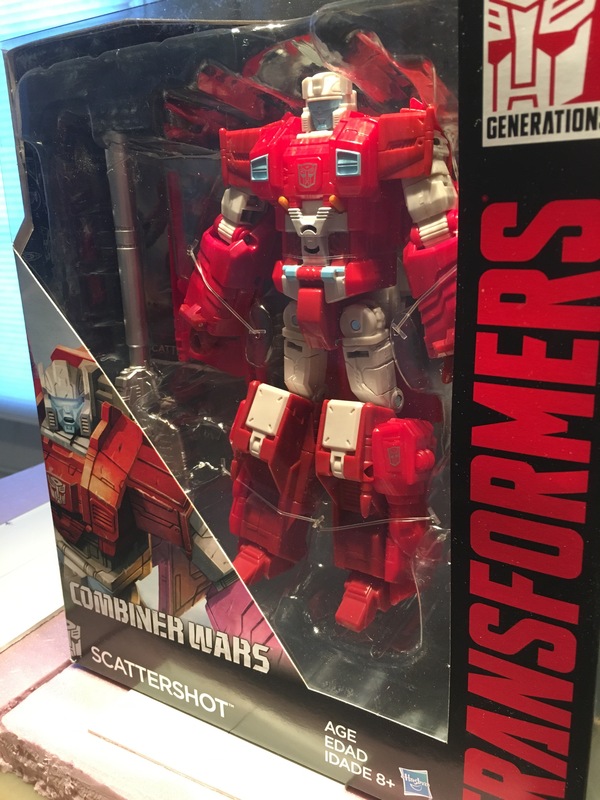 I got Onslaught initially, but I passed on Scattershot. $14.99 was too good a deal to pass up, even if he won’t have any other extra figures to play with. It was a vast improvement on the $24.99 at retail, even if Marshalls only thinks they go for $22.00. Keep your eyes peeled if you are headed to the discount stores. Good stuff hides there occasionally. I went on a 3 1/2 week road trip across America. We started here in California, went the northern route across Montana and North Dakota. We ended up in Wisconsin to see some friends before turning back and going across Nebraska and Iowa to see some friends in Colorado. From there it was a hard push home back to California. In all is was 5310 miles towing a travel trailer. There were lots of breaks along the way, mostly at Walmarts. Most of them were bust, but when I hit it big, It was really worth the stop. In Star Wars, I was able to find the much desired Ashoka Tano. Along with her, I found the new Luke, Jango, and Kanan Jarrus. In Colorado, there were clearance Halo 5 figures I didn’t yet have at Target. Looks like Target is clearing out most of their toy departments here at summer. Marvel Legends proved to be very good. I first only found Iron Man for the Giant Man series. Then I hit it big time and found the rest of the wave. I also found Agent Venom at a Walgreens. I went in looking for the new figure, Namor, but came away with a super figure. It was also on sale, listed as Ant-Man, so that was an extra bonus. In Transformers, I found the first wave of Legends figures in the Titan’s Return. Later I found the First wave of the Deluxe figures. They are so sweet looking. I also found a couple of Robots in Disguise figures. Quillfire was the first figure I found on the trip, early on just a few days in. 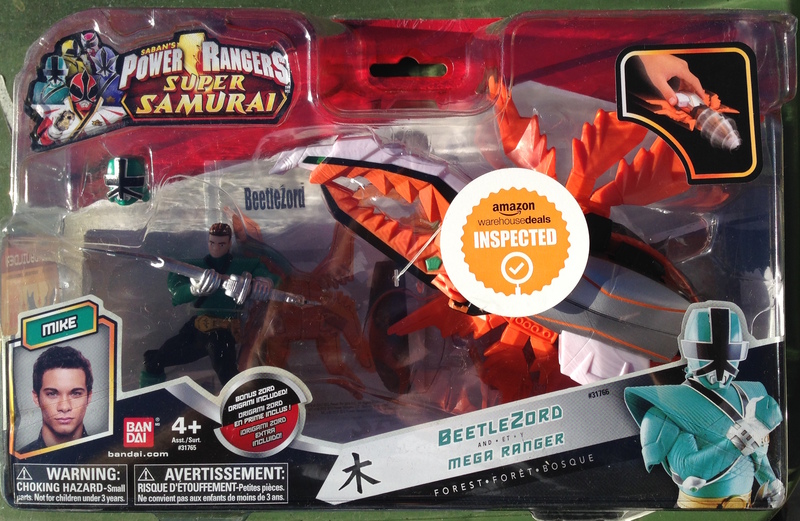 In Power Rangers, I found some great stuff, including Titano Charge Megazord, and the Archelon Zord. I found the missing charger I needed to complete the numbered part of the charges, and I found yellow ranger from Super Megaforce. Then there were the randoms. Planes – Tractor Buck, TMNT – Dire Beaver, a couple of Hot Wheels, and two packs of MiniMates that were exclusive to Walgreens. It was a great 3 1/2 weeks of travel. And getting to stop often to stretch the legs and look for good stuff in random states made some of the boring driving better. I left in the middle of reviewing the Marvel Legends Absorbing Man series, and had more in Transformers I was ready to look at. Not to mention some of the Japanese figures I have gotten my hands on right before I left. There is a lot of stuff I was ready to tackle, and now the pile is huge. Glad I have a few more weeks before school starts up again, and my life is sucked up with teaching. I hate Toys R Us!!! So I saw online this morning that Toys R Us is running a sale on the Mighty Morphin’ Legacy Falconzord. $59.99 instead of the usual $79.99. I went to the website, and there it was in all of it’s white and gold glory. I clicked on the “Add to Cart” button, and it gave me a popup for a Free Store Pickup Today. The problem is that there is no store within 50 miles that carries the Falconzord. So, I cannot order it online from the website because all of the stores in my area cannot figure out that they need to actually have a stock of a Toys R Us Exclusive toy?!? Come on! I have not even seen one of them in the store, and I have frequented many of these stores recently. I have been burned too many times when items are labeled with this sign. When I see posts of upcoming toys and I hear they are Toys R Us exclusive I have to shout, “Fuuuuuuuuuuuuudge!” But I did say ‘fudge’. Anyone get my A Christmas Story reference? If not shame on you and add that to your watch list for 9 months from now. I don’t get it. I am a grown adult with money to spend on specific items. Toys R Us has the market cornered on one of those items, Power Rangers, and they cannot seem to get it right. It is too bad there isn’t a store out there that is dedicated to selling toys… oh wait, that is exactly what Toys R Us is supposed to be doing. They are a toy store… I think. It is is in their name. Bandai is creating some of the best figures it ever has, and they are working with the devil. Toys R Us seems to have such a hit and miss record for ordering. In my area alone, I have 4 TRUs within what I would call ‘driving distance.’ There were 5, but they closed one down so they could sell the land to put up apartments. We live in one of the most expensive housing areas in the country, and yet they cannot stock the items people really want. Nor do they stock items that they have the cornered market for. It says exclusive right on the box. That means no one else can carry it. People will HAVE to come to TRU to get it. Maybe that just doesn’t make sense to them. Now that the steam is really rolling out of my ears, I will end this rant. On to better things as I figure out what I am going to do about getting my hands on this beautiful bird. I did get the Legacy Megazord on Amazon for a great price, so I can start back filling some of the old Zords I do no have in my collection. I am a toy hunter, not a box hunter. I have found a few toys over the years that I had been scouring the stores for, only to find one that has been pretty badly damaged. I know I probably only scored the figure since someone else was looking for a nice box. Sometimes, when we go through online retailers, we don’t get a say in what we buy. The items usually show up in good order. Recently, as in Monday, I was looking at a Power Ranger from the Super Samurai series on Amazon. $54.99 was a bit much for me at the time, but I noticed that there were some selling for a LOT less. Generally these are hit with pretty hefty shipping charges that end up not saving any money at all, but I thought I would give it a try. Clicking on the link, I noticed one that was a lot less, and with free Prime Shipping. 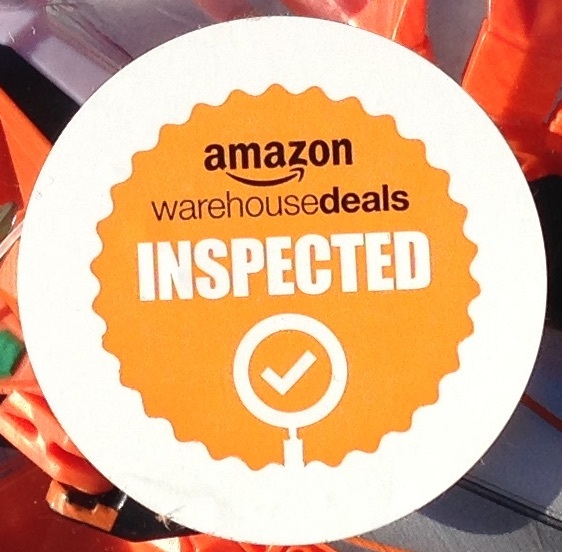 It stated it was an Amazon Warehouse deal. 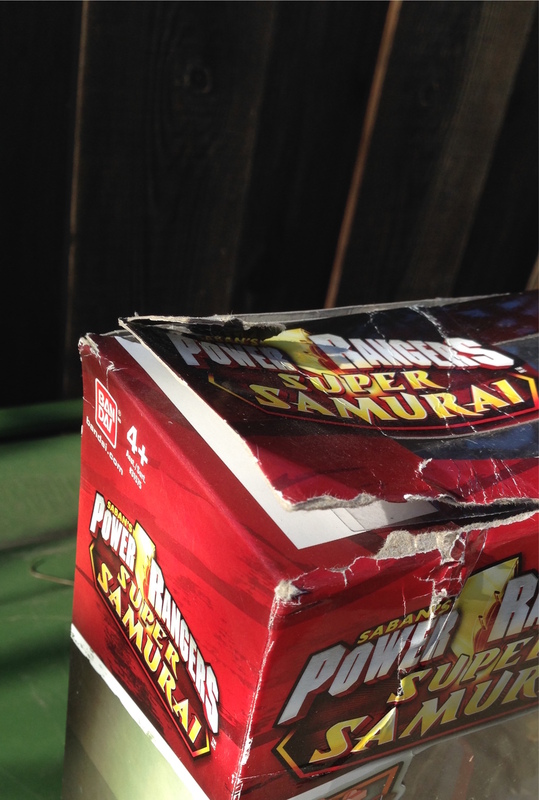 The box was in bad shape but the items inside were inspected. 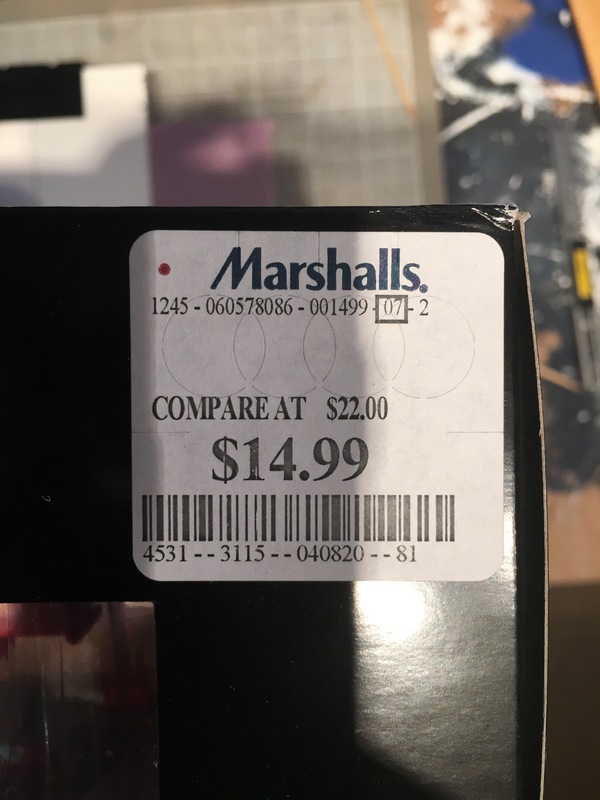 A markdown from $55 to $41 just for a bad box? That is my kind of deal. Well, it took a couple of extra days to get here, but here is what I ended up with. Samurai MegaZord in all of his 5-Zord glory. From the front you can see that the box is a bit tattered on the top left side. It looks like it had been crushed inward from the edge. Mind you, there is nothing up there to get damaged. It is rather superficial, and just what I was hoping. I get all of the important info off of the back, but with a lower price. 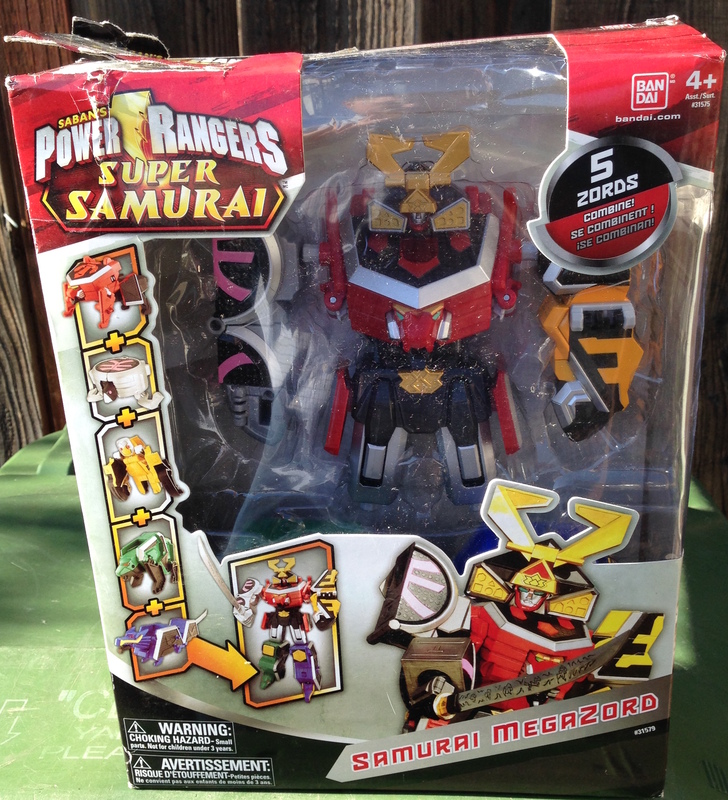 Not to be one to miss a deal, I had seen a second Zord that also was a Wearhouse Deal. This one going from $14 to $6, I was hoping for a double shot at a great deal. And here is how it came. This one I actually had to laugh at. There was one plastic tab that had slipped out of the tape, and a crease on the back. I have found more damage on regular items shipped to me. So, if you are like me and don’t care about the packaging, make sure to do a little looking around before you click on the Check Out button. There could be some nice savings in it for you! All of my Transformers collectors, beware! I was at Target on Saturday on a “regular” shopping trip. Of course I have to take a walk down the toy aisles. A little hunt for some Hot Wheels that got me nowhere. Then a trip down the aisle wi Transformers. I was so excited to see the new Prime Starscream. As I reached out to grab him, I flinched like I had been burned. There above the figure was the price. $19.98. THE WHA!?!?! Are you telling me that those horrible higher-ups at Target are trying to get us to pay $20 for a flippin’ Deluxe figure? Um, no! The larger, better Soundwave is only $22. Something is wrong here. To add insult to injury, I was out the next night for a little dinner. On the way home, we stopped by WalMart. There they had another figure in the Beast Hunters line, and it was only $12.98. Confirmation that Target is out to screw us. Boy, I remember not too long ago when I could come to the San Jose Super Toy Show and walk right in for the Early Bird Special. Pay a little extra and not have to deal with crowds. Now, there is a line just to get in. Ah, well. As long as there is something good for me to buy, as there usually is, I will be fine. And, lines mean people. People mean money. Money drives everything, so the show will go on. From line, you on the ground reporter. Hopefully reporting again soon with some good stuff.